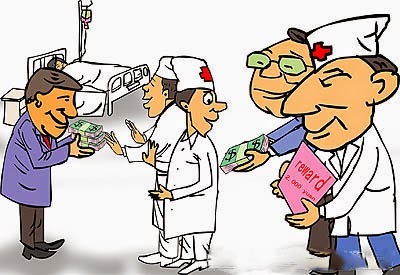 In an effort to clean up hospitals and crack down on bribery, patients and doctors will be required from 1 May to sign mutually-agreed contracts forbidding the giving or receiving of' red envelopes'. The new contracts, ordered by the National Health and Family Planning Commission, will be an extra step of the hospital registration process and are intended to reinforce the message that doctors can no longer rely on 'grey channels' for their income. However, a survey carried out at one Beijing hospital that has trialled the system raises the question of whether it is all just for show - and whether it is perhaps just another bit of bureaucracy to contend with. An anonymous survey carried out at the Meitan Hospital in Beijing asked 122 patients and 55 doctors what they thought about the giving of 'red envelopes' or gifts to medical staff and whether they accepted the new 'no red envelope' contract system - which has been operating at the hospital for two months. Interestingly, about a quarter of patients said they had been prepared to give a red envelope before signing the contract, whereas two thirds of patients said they hadn't thought about it. The remainder 10% were 'definitely not' prepared to give a red envelope. About 57% of patients said they agreed with the red envelope contract, whereas about 35% said they thought it was not necessary. Of the doctors, 100% said they would not accept a red envelope or gifts from patients. Despite this, 40% of the doctors said they were not happy about signing the new contracts, and 20% said they were strongly opposed to the contracts. When asked why, doctors said they had already agreed to the Hippocratic Oath when they first donned their white coat, and they believed this was already a contract not to accept bribes. However, hospital manager Wang Mingxiao said that the new contract system was a visible way of showing patients and their families that the hospital staff were "clean and incorruptible". Mr Wang said the contract system was an essential step in the hospital's setting up of an 'honest and clean' checking and monitoring mechanism to ensure ethical medical practice.